Who's name is it anyway? The river Chet rises over Poringland way and runs for about fifteen miles to join the Yare between Nogdam End and Norton Staithe. The original course of the River at Loddon was some yards to the north of the present river and several times over the years, in times of flood, the river has tried to revert to its old course! See Accidents & Disasters. In days gone by the river might have proved a barrier to travellers if it had not been fordable where its route was crossed by a band of hard gravel. Here, the twin settlements of Loddon and Chedgrave had grown up on the higher land on either side of the stream. Between what is now Pye's Mill, in Loddon, and The Pits, in Chedgrave the ancient road crossed the river at the shallows as a ford. The whole length of the river has been straightened, dredged and deepened but the road pattern can still be seen. There was a mill mentioned at Loddon in the Doomsday book and a watermill at Chedgrave in the early 1330s, but we have no evidence for the sites of these mills. We believe that the present mill, which is no longer functioning, was built in the 18th century and the river diverted to run underneath it. The mill pool was never very big, but was apparently a widened and deepened Y shaped section of river up stream of the mill. This obviously produced perfectly adequate power for the miller to meet the needs of the local farmers and villagers. 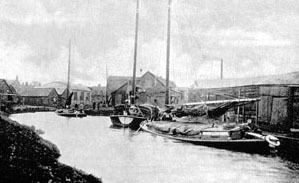 By the late 1880s Woods, Sadd, Moore, corn and seed merchants had moved into the village, first taking over the maltings in Beccles Road from Lambs Corn & Seed Merchants and then the watermill from William Chapman and thus the 'industrial development' of the riverside began . At the turn of the last century, Woods, Sadd, Moore along with another corn and seed merchant, who had premises on the Loddon river bank, financed the digging out of the river to make it navigable for wherries. Heavy or bulky goods were routinely carried by water and the Norfolk wherry was the perfect craft for navigation on the narrow, shallow waterways. 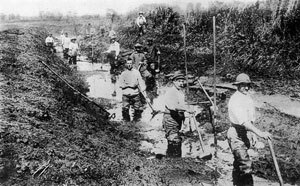 Before the dredging of the Chet, many wherries had to unload their cargoes at Hardley Dyke (See 'Langley-with-Hardley' by S.C.Carpenter) or possibly at Chedgrave Staithe and transport their goods by horse and cart along the road to Loddon. Some yards down from the mill the river was made wide enough for a wherry to turn around. Woods, Sadd, Moore had dug out the wherry turn for the convenience of their own wherries. However, many other wherries used to come up river to unload, some at the coal wharf on the north bank, and some at Loddon Staithe, where the Pye's Mill pic-nic area is now. Woods, Sadd, Moore had a chain strung across the river, just downstream of the wherry turn, and other wherries had to pay a shilling to use the facility. Mr Frost from the coal yard and Joe Eggitt had a coal wherry which used the river and unloaded below the chain but they hated to pay to turn it round. With a loaded wherry, at low tide, in the dark, with the mast flat down they could just squeeze under the chain, turn around and slip back!